With the latest deluge of arrivals in the Rolex Fastnet Race, overall victory is currently looking like it might be claimed, in this 90th anniversary running of the Royal Ocean Racing Club's flagship offshore race, by a fast boat in the 35-40ft range. Most promising at present is Gery Trentesaux's new JPK 10.80, Courrier Du Leon. Overnight arrivals have caused the corrected times of Rambler 88 and Leopard to plummet down the IRC Overall leaderboard, leaving Dieter Schon's Maxi 72 Momo strongest among the big boats. American Ron O'Hanley's Cookson 50, Privateer, winner of the 2013 RORC Caribbean 600, finished in Plymouth at 19:25:08 yesterday evening and looks set to be on for a top 10 position overall and is currently second in the IRC Canting Keel class behind Nicolas Groleau's Mach 45 Bretagne Telecom. "It was almost two different races," O'Hanley recounted. "It was a very challenging start in the light air, which then got progressively worse! In essence the really big boats got through and we hoped to be one of those, but 50ft turned out to not be big enough." Privateer lost contact with the biggest boats in the fleet at the Scilly Isles, but was not alone in doing so. "Everybody just parked and restarted and I think we did as well as anybody at getting going again," O'Hanley continued. "We went west and then made a great approach to the Rock. After that conditions got better and better and we could fly. It was our kind of sailing, we were able to use our big kites and still not fall off, so we made excellent VMG on the way back. We were averaging 16 knots." This was O'Hanley's first Rolex Fastnet Race and he was thoroughly impressed. "The whole navigational and tactical side of this race is extraordinary; an unbelievable race in the choices to be made all the time. And, as always, the RORC does an excellent job running the race." On the 13 year old IMOCA 60 Rosalba, also racing in IRC CK, Andy Greenwood's crew put in a sterling effort to hang on to the coattails of the new, much faster IMOCA 60s. Staying high and picking up a back eddy off the Lizard outbound, Rosalba remained up with the new Safran. However, subsequently heading offshore, she lost contact with the fleet and Greenwood chose to split and head up the west side of the Traffic Separation Scheme off Land's End. He explained: "My initial thought was to go west to get the new pressure, but everyone else went north, partly because there was pressure there at the time and they were going with the northerly current. So - do you go by what is there at the time or to where you want to be long term? So we took a bit of a punt." "Rosalba is a boat we use mainly for charter work, so we had guests on board," recounted Greenwood. "For them, it was fantastic to go around the Rock with Safran in front and Banque Populaire behind us, the oldest boat in the fleet, sandwiched between the two newest!" In IRC Zero, one of the race favourites - Piet Vroon's Ker 51, Tonnerre 4 - finished at 19:57:06 yesterday evening, but was unable to displace Momo from the top of the leaderboard. Sadly Vroon, now 85 years young, was unable to compete (having previously sailed in 25 Fastnet races) due to a recent back operation. "He was disappointed not to be here," said boat captain Frank Gerber. "The race was really tough," Gerber continued. "We didn't get a great start, so we sailed from transition to transition, gust to gust, and every single time the fleet would compress. We'd end up in the position where we'd do a pretty good job - getting over to Land's End for example - and then the entire fleet would compress against us." Becalmed northwest of Land's End, Tonnerre managed to catch the IMOCA 60 fleet. "We got a nice puff and sailed ahead of the fleet - in our own private bit of pressure. I went up the rig and looked across to see all the 60s and 65s in no wind at all!" Once the wind did fill in on Tuesday morning, Gerber described it as "wet and wild and cold!" But these were conditions the race-hardened Tonnerre crew was used to. On the fast reach back from the Rock, Tonnerre was hitting mid-20s boat speeds, making up the deficit lost during Monday's park-up. However it wasn't enough to out gun Momo. In IRC 1 Samuel Prietz's Ker 39 GOA finished at 10:31:03 BST this morning and currently leads from Mike Bartholomew's GP42 Tokoloshe II and Eric De Turkheim's Mini VO70-like A13 Teasing Machine. This morning the leaders in IRC 2 are making their final approach to Plymouth with RORC Commodore Michael Boyd's Grand Soleil 43 Quokka 8 jockeying for the lead on the water with François Lognoné's MC34 Solidaire En Peloton, class leader on corrected time. Impressively, while the bigger, faster IRC 2 boats had yet to finish, Gery Trentesaux's JPK 10.80 racing Courrier Du Leon in IRC 3 was already berthed, having finished at 11:12:42, comfortably leading her class and looking strong for the overall prize. 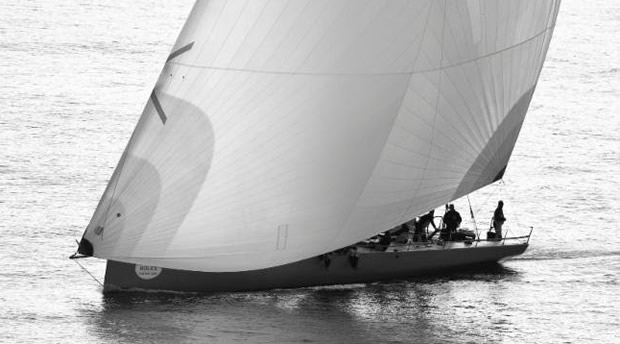 The next IRC 3 boat, Arnaud Delamare and Eric Mordret's JPK 10.10 Dream Pearls was due into Plymouth imminently. In IRC 4 Gerard Quenot's JPK 10.10 Alkaid III - Nautistock.com was leading both on the water and on corrected having passed the Lizard at 1100.